Phone that capture image with recognizably of Voice. LG have launched the great new technology leased phone, that have pretty awesome feature that any others phones have. In the comparisons od Apple and Samsung newly launched gadgets, LG Electronics have also launched its new series of smart phone "Optimums G" that have awesome feature which can attracts consumer on this. This smart phone have featured camera that capture clicks with recognisation of your voice. This means its camera will work with "Voic Command". By this LG will give challenge to Apple Iphone that have launched recently. Price of this phone will be $900 which is approx Rs40 thousand INR. Recently Iphone5(by Apple), Nokia 900 Lumia and Motorolla DriedRazer have been launched in the market. 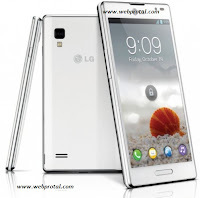 On this situation LG Optimus will have something hard to make the place on the market. But by the New technology LG can gain much better place on the market.